For the couple whose love story and nuptials are rooted in Atlanta, the city provides intriguing potential and endless possibilities for charting your wedding day photography. Your first stop along your wedding day photo session itinerary is Atlanta’s City Hall, a place that embodies the culture and history of this beautiful metropolis. Located down the hill on Mitchell Street to the southwest of the capital building, this iconic building stands on the site of General Tecumseh Sherman’s headquarters during the occupation of Atlanta and is now listed on the National Register of Historic Places. The exquisite stonework and expansive front steps of the front entrance, accessed along Mitchell Street, offers the ideal place to begin your wedding day photos. Have your photographer arrange several poses of the entire bridal party extending horizontally along the low steps, making sure to capture the height of the building as it rises above. Then arrange a solitary pose of bride and groom next to one of the marble pillars flanking the steps, allowing the elegant tones to contrast with the romance and intimacy the newlyweds share. After several shots outside the entrance, move into the Hall to orchestrate several more shots integrating the richness of detail and color into your photos. 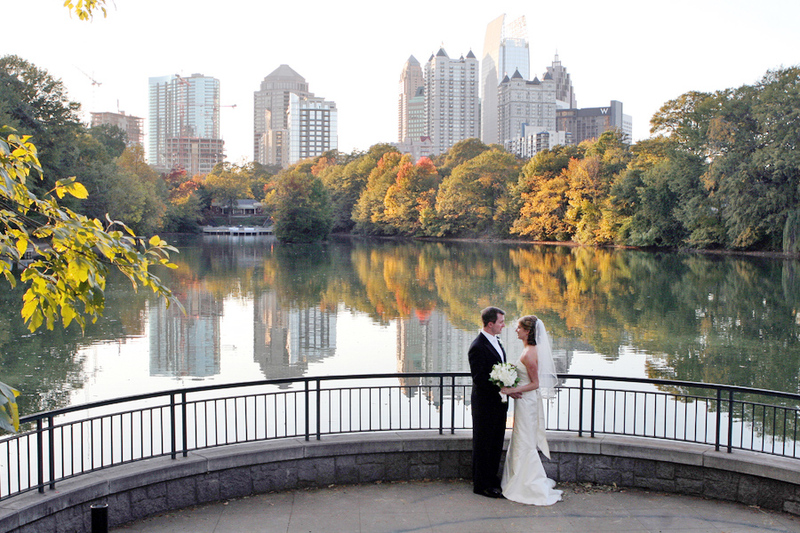 Embrace the grace and prestige you seek for your wedding photography at the Ritz-Carlton, Buckhead. Evoking the graciousness of the Old South yet endowing your photography with a feeling of distinct modernity and class, the Ritz-Carlton, Buckhead will not disappoint as a highly sophisticated setting. Set within the city’s most prestigious and desirable neighborhood, the Ritz-Carlton is just miles from the cultural and entertainment center of Midtown Atlanta. Pause first beneath the cobalt awnings heralding the entrance to the famed hotel. 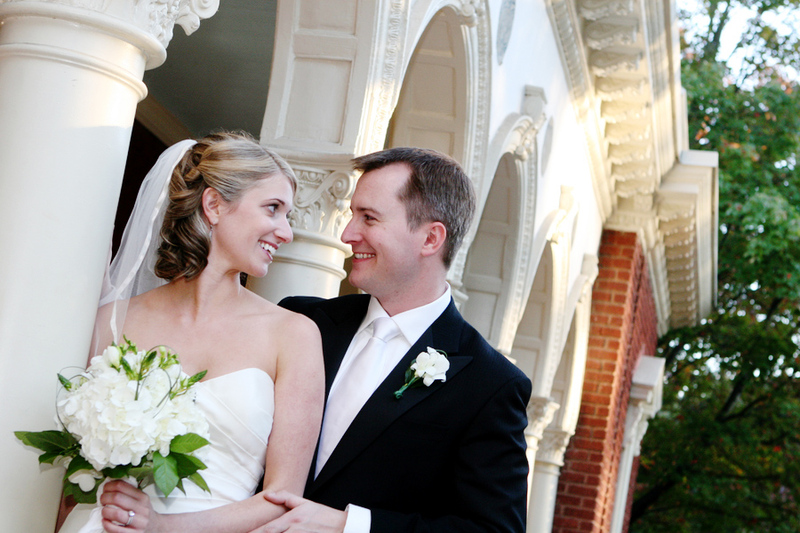 Marble pillars create an ideal frame for a shot of bride and groom alone. With your wedding photographer, arrange a solitary pose against one of two robust pillars allowing the muted tones of the marble provide an understated accent for your photography. Bring the entire wedding party into the next series of shots as you move further into the awning covered entrance. Pose against the polished wood of the classically paneled doors. The elegance effected through the intermingling of glass, wood, and stone creates an entrancing backdrop for your group photos. Glide beyond the lobby to the sundeck and shimmering indoor pool. Have your photographer arrange a solitary pose of bride and groom on the edge of sundeck with the cityscape of Atlantic beyond. The romance of this setting is heightened at dusk when the changing colors of the setting sun create a stunning mirage around the newlyweds. Prolong your time on Peachtree Northwest after the Ritz-Carlton and move next to Rhodes Memorial Hall as you transition from the timelessness of the Ritz to a more distant era. A testament to a grander past in the midst of commercial real estate and modern urban buildings, Rhodes Hall carries the taste of Atlanta’s history and the older grandeur of Peachtree Street. Among the few remaining pre-World War I Atlanta mansions, Rhodes Hall was designed at the turn of the century, inspired by the Romanesque style of Rhineland castles in Europe and built to suit the tastes of its wealthy owner, Amos Giles Rhodes. Soak in the historic elegance of the baronial home and its grounds as you arrange a group shot of your wedding party in the foreground. Though reminiscent of a European structure, Rhodes Hall is a decidedly local structure rooted in Atlanta. The granite exterior made use of stone mined exclusively from nearby Stone Mountain. Have your photographer capture turrets and towers that characterize the façade and lend a sense of romance to the background of your photos. Arched windows and the dreamy veranda wrapping the lower level contribute further detail to the sophistication and old world charm of this phase of your wedding day photography session. 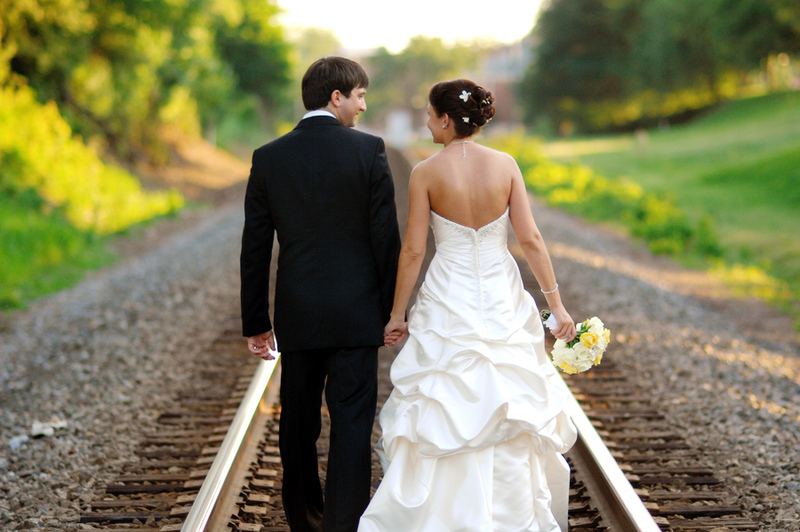 Just east of Peachtree Northwest lies the next setting for your wedding day photography. The Fernbank Museum of Natural History is an Atlanta landmark; your focus will be the Slaton Rose Garden that adjoins this impressive museum. An absolute gem of a location and virtually free of unnecessary publicity, the Slaton Rose Garden offers your wedding party a breathtaking location without the distraction of crowds and tourists. The hundreds of rose varieties that populate this garden with its array of colors and visual mystique bloom from mid April to late October, allowing you ample opportunity to stage your wedding photos. Capitalize on this space for formal shots of the entire bridal party, letting the natural hues of the roses to highlight the tones and textures of your attire. Following several group shots, have your photographer arrange a few final photos of bride and groom alone among the blooms. There is no fee to enter the garden, and its understated status among Atlanta locations makes it the perfect setting to conclude your wedding day photo session.